FORZA MODIFIED DIRECT COIL IGNITION SYSTEM HAS BEEN THE ULTIMATE IGNITION SYSTEM IN THE FERRARI AFTERMARKET COMMUNITY SINCE 1996. WE HAVE MANY HUNDREDS OF SATISFIED CLIENTS ALL OVER THE WORLD WITH OUR FORZA MODIFIED DIRECT COIL IGNITION SYSTEM FEATURING THE XDI. ​WE OFFER FULL TECHNICAL SUPPORT DURING INSTALLATION AND WE ARE VERY EXPERIENCED IN THIS SYSTEM FOR ALL FERRARI V8 APPLICATIONS. with Electromotive's Forza Modified eXtreme Direct Ignition System! The XDI is the latest ignition system from Electromotive. This new, configurable ignition system uses a controller with one or two Direct Fire Units (DFU) to power up to 14 different engine configurations. The XDI uses Electromotive’s patented direct fire ignition and it’s high-resolution crank position sensing to produce the most accurate and most powerful ignition available in the aftermarket. A "Direct Fire" ignition fires the spark plugs directly from the coils and not through a distributor cap and rotor. This is accomplished by using multiple coils, each with two spark terminals. The coil terminals are connected to the spark plugs, allowing one cylinder to fire on compression while its companion cylinder fires simultaneously on exhaust. Open spark gaps in the rotor and cap are eliminated, making wear and moisture problems a thing of the past. 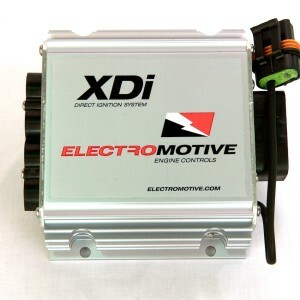 What sets XDI apart is the ability to charge multiple ignition coils at the same time. This increased dwell time means that full spark energy is available over the entire RPM range (up to 9600 at 12 volts). Unlike Capacitive Discharge systems that only put out one very short spark, the XDI puts out a full energy, long burning spark at your highest and most critical engine speeds. Long burn times assure effective burning of even lean fuel mixtures. The brain of the XDI includes dual digital microprocessors using patented spark algorithms (patent number RE 34,183), which takes the electrical signal from the crankshaft sensor, identifies the two missing teeth and then keeps track of the remaining 58 teeth. The XDI determines engine speed and computes the spark advance from your knob settings. Setting the timing advance curve is a simple task that anyone can understand. In addition to synchronizing and firing the plugs at the correct advance angle, the XDI also computes the exact dwell to produce 9 amps of coil current. Coil charging is measured dynamically, so changes in RPM, battery voltage, or temperature are all accounted for on every spark. This corrects any errors that are caused by battery voltage or coil temperature changes and insures maximum spark energy. Some OEM direct ignition systems use both a crankshaft and a camshaft sensor assembly, making the system more complicated and more expensive than it needs to be. Other systems use low resolution, four to ten tooth trigger wheels on either the crankshaft or camshaft; these are not enough teeth to assure that the coils are firing without timing errors. The XDI solves these problems with a single, high resolution, 60-minus-2 tooth crank trigger wheel. This affords resolution unheard of in any other electronic ignition available today, offering spark accuracy of ¼ degree of crankshaft rotation. This accuracy makes the system ideal for the most demanding engines. relays, fuses, wiring harness, coil packs & XDI brain box plus 24/7 TECH SUPPORT during installation. 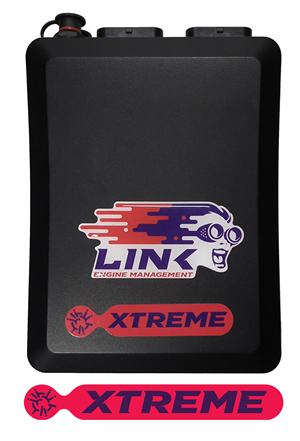 G4+ Xtreme ECUThe Link G4+ Xtreme ECU is Link’s most powerful engine management system ever. It equals or betters any ECU on the market. Whatever the application, the G4+ Xtreme ECU’s advanced configuration enables today’s complex engines to be optimised. Flexible options over the control of inputs and outputs allow the user to design their own functions to control all sorts of devices. Precise control of injectors and ignition angle are guaranteed at very low or high RPM or manifold pressures. A very high level of protection from interference and tolerance of trigger input errors has been built into this ECU, ensuring a smooth running engine even under the most demanding conditions. 8 x fuel & ignition. Requires “A” & “B” Looms. The G4+ Xtreme (black) offers the ultimate in engine management.